Ahh... 14+ degrees (57 to you nutty Americans) today... after a long Easter Monday of basement renovations, a beer on the deck was in order. On today's menu: Garrison's Pils, their first pilsner / lager. 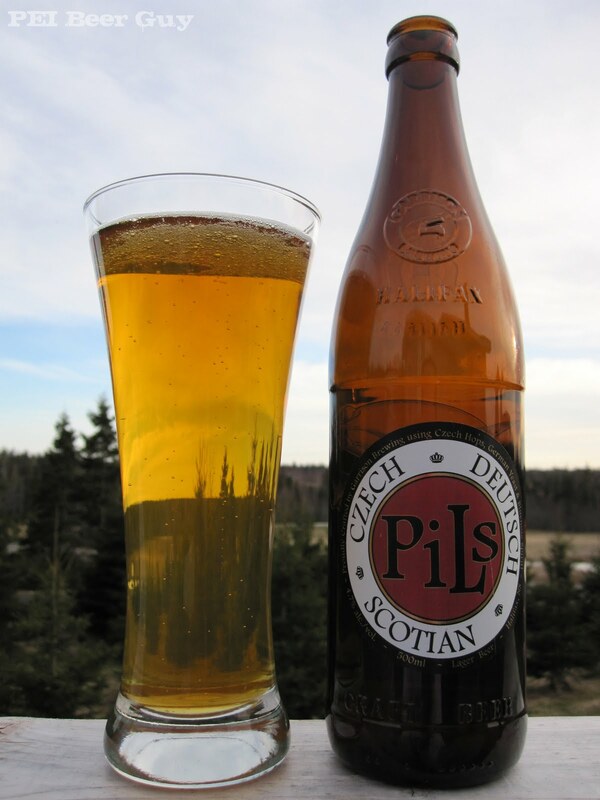 Pils pours a clear, medium-gold colour. A bit of head (advertised as long-lasting) is gone quickly. There is no lacing to speak of, but there are active bubbles in the glass from the carbonation. The aroma out of the bottle is surprisingly fruity... almost like a a faint, malty, orange peel aroma... it reminds me of a light version of an American pale ale... perhaps it's the 2-row pale malt that's doing this (I wouldn't expect what I'm getting from the Saaz hops). The fruitiness eventually gives way a bit to grass and some hints of wet straw / dog. In the flavour is a bit of the fruitiness as well. That faint fruit starts as the dominant flavour, and then it progresses to a bready / biscuity finish that is almost lemony - nearly like a muted lemon shortbread. The feel is a bit sticky on the sides of the tongue / mouth, and mainly dry up the middle. The bitterness is obvious, but it may be a bit strong for the style (although it matches this brew's pale ale leanings). The body is, of course, light. The carbonation is crisp, bordering on sharp. Overall, this was a nice pilsner of strong character. I liked its surprising traits. Too bad they're all sold out at the brewery for this year, but I imagine they'll be returning next winter / spring.